I normally review the Theaker’s Quarterly bookazine on a semi regular basis so it is of interest to me getting an actual novel from the same publisher. I am used to reading their short stories, so when this came along I had an opportunity to read much longer stories in this collection, more novellas with a short story. As there is no explanation on the back cover about the book or the characters, even the story, Rafe has been good enough to give us readers a small paragraph inside on the first page on Mr Langham and his origins. As a retired soldier, police inspector and occult detective. He works alongside Dr. Watson and Colonel Sebastian Moran, one of Holmes’s many enemies. 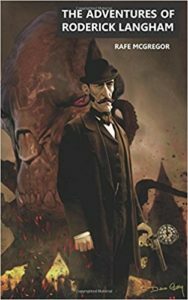 The Adventures of Roderick Langham far from being a standard novel is a series of short stories that tell of Langham’s brushes with the unknown. I like to read short stories by authors as it gives me a chance to see if their writing style matches what makes me tick. Here we have nine such stories, all different and all interesting. It does what I imagined it would as I have come to know that the Theaker’s team tend to produce books and bookazines of quality. McGregor has written his stories in the style of Sir Arthur Conan Doyle with the ease of a man who has studied his work. There are several stories I have cherry picked as what I consider to be the best. In The Long Man, Langham investigates the Wilmington Giant which is thought to exist only in the realms of urban myth; then there’s the matter of where Roderick’s surname name derived from. In The Tired Captain, we are taken to the realm of Bram Stoker’s Dracula with an account of the Demeter’s captain and what was written in the ship’s log. This is a creepy and interesting take on the original story written from a different point of view. In The Paradol Chamber, Watson has correspondence from Colonel Moran concerning Holmes’ involvement in the Whitechapel case. Moran is interested in meeting with Holmes yet again, but this time he wants Watson there to prevent Holmes killing him. This, I could say was my firm favourite as Moran and Watson, this time turn out to be on Holmes’s naughty list. The Adventures of Roderick Langham is one of those books that is essential for those into Holmes and Watson, Cthulhu and the Dracula mythos told differently. 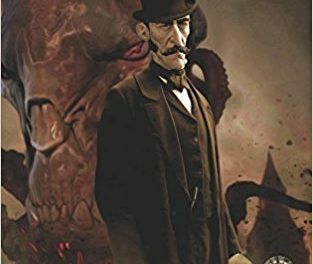 Works based on Holmes and Watson could go on forever and not lose their impact on the readership they have developed since the resurgence of novels, movies and the TV series based on them.